Fujitsu Laboratories Ltd. today announced the development of millimeter wave circuit technology for base stations that, while consuming the same level of power as a Wi-Fi access point, deliver the high-speed communications in excess of 10-Gbps required by fifth generation mobile communication formats, or 5G. Beam-forming technology concentrates signals in just one specified direction by setting a large number of antenna elements, 128 of them, into arrays, and controlling the phase of the signal to each element. 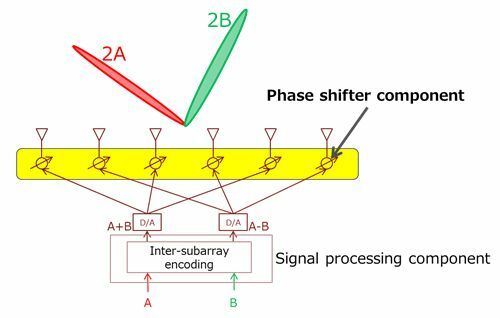 Fujitsu Laboratories previously developed technology to encode signals between sub-arrays, providing both high-speed communications and low power consumption by encrypting the signals in such a way that cancels out unwanted signal interference. Now, Fujitsu Laboratories has developed millimeter wave circuit technology for a phase shifter, a type of circuit which controls the phase of signals to antenna elements, which reduces the number of amps and minimizes the electrical loss of a circuit. 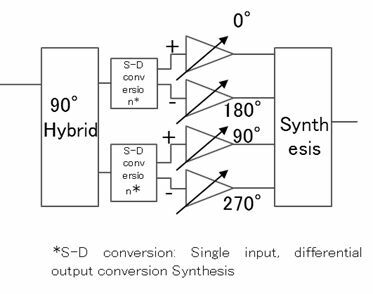 This thereby enables the power consumption of the phase shifter component to be halved. This technology successfully reduced power consumption to 3W when used with 128 antenna elements. By combining this technology with the previously developed technology, high-speed communications using millimeter waves are now possible with small 5G base stations that can be deployed in places that have a large concentration of people, such as near train stations and in stadiums. Details of this technology will be announced at European Microwave Week 2017 (EuMW 2017), which is being held in Nuremberg, Germany, October 8-13. Recent years have seen ongoing R&D into 5G in countries around the world with the aim of practical deployment in 2020. 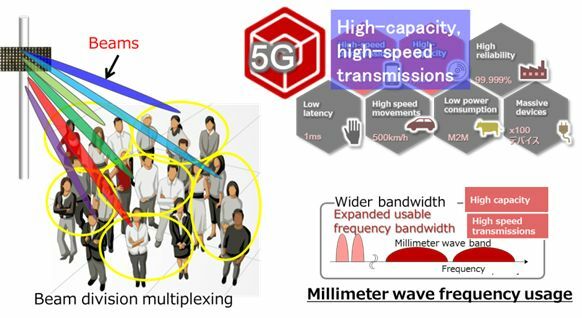 In order to achieve one of the requirements of 5G, namely high-speed, high-capacity communications in excess of 10-Gbps, the millimeter wave band is expected to be used as it offers a wide useable frequency bandwidth. A service that this technology could enable, for example, would be in a sports stadium in which each individual user could stream high-resolution video from their mobile device to watch replays or other content. While millimeter waves can provide high-speed and high-capacity communications, they are very one-directional, and do not have the ability to bend around objects to any great degree. In places with a high concentration of people, it is envisaged that the use of a method called small cells, in which base stations are deployed every few tens of meters, will be called for. These base stations will require technology that can handle communications with multiple users simultaneously by dividing and multiplexing beams using a technology called beam-forming, which uses multiple antenna elements to concentrate the signal in a desired direction. In beam-forming technology, Fujitsu Laboratories has already developed technology that encodes signals between sub-arrays that reduce antenna array power consumption(1) , succeeding in providing high speeds and capacity while reducing power consumption. However, in order to deploy multiple base stations in places with a high concentration of people, such as in stadiums and near train stations, the goal has been to reduce power consumption to about 10W, equivalent to that of a Wi-Fi access point, but such a goal had been difficult to achieve until now. Fujitsu Laboratories has now developed technology to halve the power consumption of circuits called phase shifters. Phase shifters control the phase of the signal to antenna elements by reducing the number of amps, which are essential components of phase shifters, by combining switching circuits with differential amps, while at the same time adopting a new millimeter wave circuit that limits the electrical loss of circuits. Phase shifters are circuits that determine the direction of the beam output from an antenna array by adjusting the phase of the input signal to each antenna in a range of 0 to 360 degrees. Up until now, each phase shifter has required four amps. 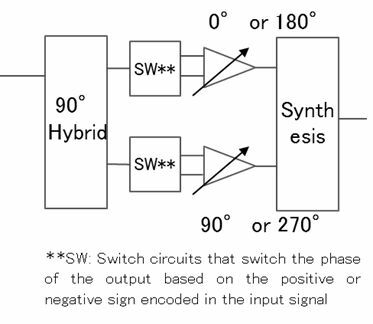 Now, by developing a new switch circuit that can switch the phase of the output signal to 0 and 180 degrees, or 90 and 270 degrees through encoding a positive or negative sign into the input signal, Fujitsu Laboratories has successfully reduced the number of required amps to two. Also, in order to reduce interference between beams, by adding the capability to measure the phase and amplitude actually set by the phase shifter and then adjusting in order to compensate for deviation, Fujitsu Laboratories both reduced power consumption and increased the accuracy with which the beam direction is controlled. 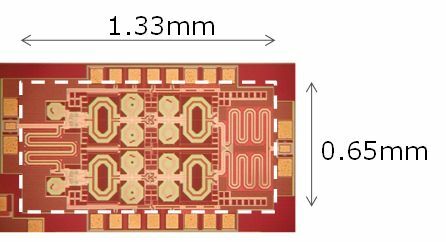 With this technology, Fujitsu Laboratories was able to achieve a power consumption of 3W for the phase shifter component, half the level of previous technology, when using 128 antenna elements. By combining this technology with previously developed technology, Fujitsu Laboratories has made possible high-speed communications in excess of 10-Gbps at a low power consumption of around 10W, similar to a Wi-Fi access point, thereby minimizing communication speed drops for users, even in places with a high-concentration of people, such as near train stations and in stadiums, by setting up multiple base stations in a smaller area, providing an ideal communications environment. Fujitsu Laboratories will conduct equipment development and field trials to create practical base stations for small cells, with the goal of offering a product from Fujitsu Limited around 2020.